The flood waters are starting to recede and roads slowly opening, from the air we can survey the scope of the damage from two monster storms which hit the US in the past month. Evaluations will be coming over the months and years to examine what was done well and what was done poorly with respect to disaster preparation, relief and reconstruction; with a robust field of experts in emergency preparedness guiding us through those discussions. What we should also keep in mind is what the storms, their cost in terms of life, anxiety, displacement and treasure, tell us about the nature of our society and enduring problems which we are slow to face or which public policies make worse. The perennial question is whether we want to encourage development in areas prone to floods and what other actions are required by government, property owners and developers to properly account for the threat from flood. In a study released from the Office of the MA State Auditor earlier in the year, we documented the lack of planning by cities and towns in Massachusetts with respect to climate change resiliency and water infrastructure. Only 6 percent of respondents said they had done any planning around the issue. Being a coastal state with significant inland waterways this is a bit concerning as we have just seen the impact of disabled water infrastructure on communities struggling to get through the storms and their aftermath. The inadequate state of our infrastructure in general compounds the problems of these weather events particularly in the face of intensification from climate change and its associated rising sea levels. The storms accentuate economic inequality, a growing chasm dividing our society across the past few generations. In an emergency, how do you move and where do you go are questions that plague residents asked to evacuate the storm. Those with the least resources, and who lack the social networks to provide comfort during the storm, become its worst victims. Beyond that, are we rebuilding damaged communities with the same type of segregation we experienced in the past? Would that be a good use of public resources? Many thousands will need some form of temporary housing during the months of reconstruction. Others may choose to relocate to avoid a repetition of the experience or to find a job to replace the one that disappears as a result of shuttered services. This process could be part of the solution to pressing societal problems and challenge many communities to be more welcoming of others. 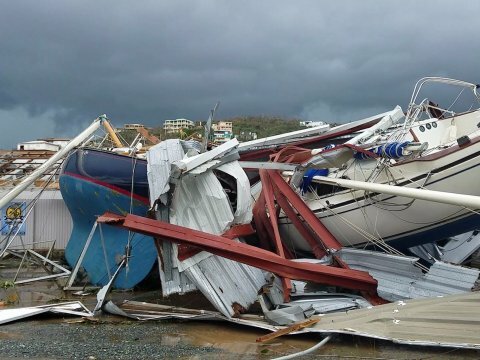 Hurricane Irma’s threats and impacts on the Caribbean reminds us of the issues with the legal status of the Territories of Puerto Rico and the US Virgin Islands. We have a glaring hole in our democracy which disenfranchises people that are US citizens but live in the islands (not unlike the same type of problem with Washington DC). Puerto Rico had a plebiscite in June to weigh in on the issue of statehood and has a task force working on the process of status change. The weakness of the press coverage of the events there in the past few weeks ignores the fact these places, while a bit remote from mainland U.S. are home to over three million U.S. citizens. These citizens will be heavily dependent on the resources and support of the Federal Emergency Management Agency, yet have little input to the political oversight of the programs approved by Congress and administered by Presidential appointees. Our complex system of health care financing makes it a challenge to properly care for people that have health issues that continue through the storm. Texas and Florida, the centers of the impact of the storms on the continent, have among the highest levels of uninsured peoples. The lack of public facilities for health care leaves nursing homes and assisted living facilities scrambling for options to relocate patients. Requirements for basic levels of preparedness, such as a week’s worth of food and generator capacity does not account for the lack of supporting infrastructure such as flooded roadways or downed power lines that might make an area largely uninhabitable for weeks, if not months. We have seen the tragic events in Florida that led to eight premature deaths as surrounding infrastructure failed even though other private medical centers were nearby. The recovery from the Great Recession has been slow and steady. There are concerns about the robustness of revenues for state and urban governments in the coming period. Responding to these challenges brought by cataclysmic events inflicting tens of billions of dollars of damage calls for swift and massive allocation of resources not just to recover, but also to provide a basis to continue doing the things the public entities were doing before the storm. The lessons of the recovery will challenge us to face head-on some of the systemic problems such as health care, infrastructure and public funding that plague us in the best of times. Author: Dr. Ben Tafoya is the Director of the Division of Local Mandates for the Office of the Massachusetts State Auditor. He has served as a local elected official in Massachusetts and is still active in governmental affairs. Ben has his Doctorate in Law and Policy (DLP) from Northeastern University and a BA in Economics from Georgetown University. He is a contributing faculty member at Walden University. He can be reached at [email protected] .